Having visited grandparents and relatives in hospitals over the years, I’ve never felt entirely comfortable in them. But arriving at the Médecins Sans Frontières / Doctors Without Borders (MSF) Reconstructive Surgery Hospital in Amman is almost like arriving at someone’s home, and home it is for many of the patients there, who have rooms on the fourth and fifth floors of the hospital. As we arrive on our first day at the hospital – a chilly early morning in February – people are milling around outside the front doors, chatting and laughing. It takes a moment to notice the wheelchairs, crutches, external fixators, missing limbs. Among the group is the first child I see, she can be no more than five years old and is wearing a compression mask over severe facial burns. I later learn from her physio, Yazan, that she pulled a pot of boiling water on top of her, causing severe burns to her face, upper body, arms and hands; these types of horrific accidents are sadly too common when people have been forced to seek refuge in overcrowded camps. I also learn that the clear compression mask has been developed especially at the hospital to replace the former mask which the children found uncomfortable and self-conscious to wear. It’s these kinds of considerations to how people feel, and what we can do to improve our patients’ experiences, which set the tone for our visit. As we enter the hospital we are warmly greeted by Dr Eve, the wonderful Irish-American Medical Director of the hospital. Eve is a force of nature. Eve is eight months into a 12-month posting at the hospital, having spent much of her life working around the world as a plastic surgeon. This is her first ‘office-based’ assignment, and whilst she thought that she would be itching to get in the operating theatre, she tells me she’s actually rather enjoying putting all her learning over the years to use in her new position. As we start our tour of the hospital we first walk past a wall freshly painted with a beautiful mural. It’s only recently finished. A muralist was brought in to speak with a number of patients about their homes and backgrounds. What he came up with, and what many of the patients helped him paint, represents all these backgrounds and cultures. The mural depicts the five flowers of the five countries: white jasmine for Syria, coffee branch for Yemen, poppy for Palestine, rose for Iraq, and black iris for Jordan. Eve says that when patients walk through the door in the mural they know there are no differences here. This is what strikes me with everyone we meet: the treatment provided, the friendships formed, the stories shared, the comfort offered, it is all irrespective of background, politics, culture, conflict. 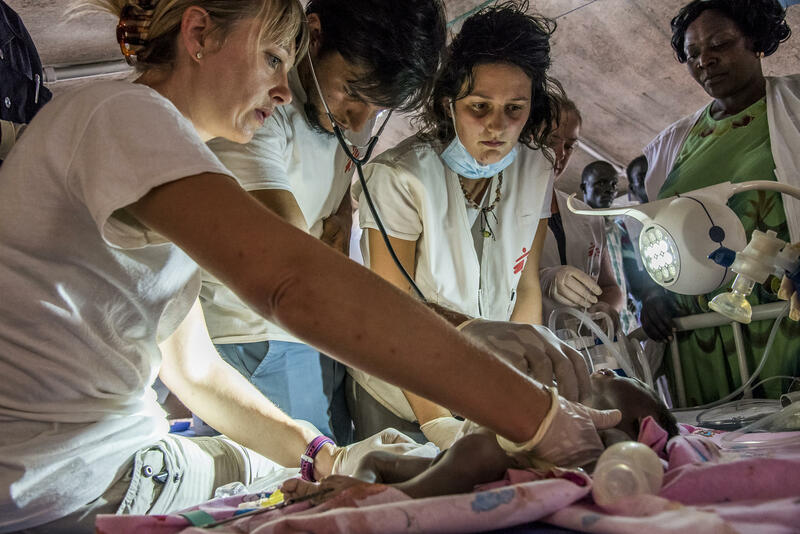 The hospital takes such a holistic approach, and this is perhaps not the type of work which MSF is most well-known for. For me this is why this hospital stands out as being so unique. Even reading about the atrocities which have brought patients here does little to prepare you for the reality of talking to people who have been through, and lost, so much. Of course, rehabilitation is just as important as surgery, and here we offer both. As Eve says, what is the point of surgery if you are not comfortable going home, going back to work, and integrating yourself back into your community? Last summer a school was even set up for the children, as well as an activity room. During our trip we were lucky to sit in on a chemistry lesson. The children were eager to learn (and certainly knew a lot more about chemistry than I did!). We heard a lot of stories over the two days we were at the hospital; patients from Iraq, Gaza, Syria, and Yemen, young and old, war-wounded people who have been through more than I could have ever imagined. One story kept me awake the first night, and that is of Joanna, the hospital’s youngest patient. Joanna’s maternal grandmother, Salima, told me their story. Joanna was just five months old when her parents tried to flee Mosul during the military advancement to take back the city from the Islamic State group. Joanna’s mother was carrying her when she stepped on a landmine during their escape out of the city. Joanna’s father was killed immediately, her mother badly injured from shrapnel which pierced her lung. Joanna’s grandparents looked after her and her mother over the next ten days, but her mother continued to lose blood and they knew they desperately had to get her medical treatment. Joanna’s grandfather carried his daughter on his back, with Joanna alongside in her grandmothers’ arms. During this second attempted escape from the city, Joanna’s mother was killed by snipers. I could almost see it replaying in Salima’s eyes. She told me she is grateful Joanna will never remember, but I know Salima herself will never forget. The initial landmine blast had resulted in a severe injury to Joanna’s left thigh, causing nerve damage, as well as the force of the impact leaving her with a fistula. Salima paid for surgery on her leg whilst in Iraq but as Joanna got older she could see that the movements in her left leg and foot were not developing as they should for her age. The family came to the hospital in Amman in December 2018, just before Joanna’s second birthday. Joanna has been having physio with Yazan every day in preparation for further surgery on her leg and ankle. Joanna is a shy little girl, but after a few minutes blowing bubbles together she was smiling and laughing. I hope, as Salima does, that she never remembers the tragedy of her earliest years. Salima, Joanna, and all those we met at the hospital during these few days are truly inspirational in their resilience. If a reminder was ever needed of why we do what we do, as MSF staff and supporters, just walking through the doors of this hospital would be enough.